The theme of the 9th Cinemanila International Film Festival (CIFF) is "Global Pinoy Cinema: Kuwentong Pilipino Para sa Mundo." 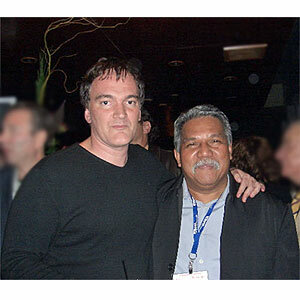 Quentin Tarantino (left) will grace the opening ceremonies of the CIFF organized by festival director Amable "Tikoy" Aguiluz VI (right) on August 8. Ang pagdating ng pamosong Hollywood director na si Quentin Tarantino ang malaking come-on sa nalalapit na 9th Cinemanila International Film Festival (CIFF) mula August 8 - 19. Tiniyak ni Amable "Tikoy" Aguiluz VI, festival director ng CIFF, sa PEP (Philippine Entertainment Portal) ang pagdating ni Tarantino sa August 8. "Siya na ang special guest sa opening ceremonies na gaganapin sa Gateway Cinema Lobby, kasama ng mga inimbitahan ding local actors like Sharon Cuneta, Albert Martinez, Yul Servo, director/actor Cesar Montano, and directors Maryo J. delos Reyes, Lav Diaz, Jeffrey Jeturian and Chito Rono," sabi ni director Tikoy sa press conference na ginanap sa Gateway Cinema Lobby last Friday, July 20. May "meet the press" din siya sa August 11, 2:00 - 4:00 p.m. sa Gateway Cinema 3. Magbibigay din siya ng series of seminar workshops on indie filmmaking, directing, scriptwriting, at film archiving among aspiring filmmakers and enthusiasts. Pinili si Quentin upang parangalan ng Cinemanila dahil bilang "jury head of the Cannes Film Festival in 2004, his love for Asian films has inspired him to adapt various cinematic styles from films of the region in his own movies. His admiration for Asian cinema has made him one of its most significant advocates, thus making him a most worthy recipient of Cinemanila’s special citation." Fan pala si Quentin ng mga local directors na sina Eddie Garcia at National Artist for Cinema and Broadcast Arts na si Eddie Romero, at gusto niyang ma-meet sila nang personal. Idolo rin daw niya ang pumanaw na si Gerardo de Leon, na kinilala rin bilang National Artist for Cinema noong 1982. Tatanggap din si Quentin ng Lifetime Achievement Award dahil sa support niya in promoting Asian and independent films. Ang dalawang controversial films na Control ni Anton Corbijn at Irina Palm of Sam Gabarsky ang dalawang pelikulang magbubukas ng 9th CIFF. This year’s festival theme is "Global Pinoy Cinema: Kuwentong Pilipino Para sa Mundo." May 100 films, mula sa 40 countries, na karamihan ay controversial movies at nanalo sa Berlin at Cannes International Film Festival, ang ipalalabas sa Gateway Cinema on August 8 - 19 Gateway Cineplex 10 at sa Boracay Island sa August 17 - 19. DIGITAL LOKAL ENTRIES. Ang Digital Lokal Entries ay ang Ala Suerte Ala Muerte ni Briccio Santos, Autohystoria ni Raya Martin, Juan Baybayin ni Roxlee, Overdosed Nightmare ni Khavn dela Cruz, Pain Things ni Jon Red, at Voice, Tilted Screens and Extended Scenes of Loneliness: Filipinos on High Definition ni John Torres. Ang bubuo ng jury para sa Digital Lokal Competition ay sina Jaclyn Jose, Filipina actress; Olivier Pere, artistic director, Director’s Fornight, Cannes Film Festival; at Ansgar Vogt, selection member, Berlin International Film Festival Forum. For the international Competition: Jesper Andersen, programme editor, Cinemateque, Danish Film Institute; Lalu Roisamri, programme manager, Jakarta International Film Festival; at Wieland Speck, director, Panorama Programme, Berlin International Film Festival. For the ASEAN Competition, ang mga jurors ay sina Jeffrey Jeturian, filmmaker; at si Tan Bee Thiam, founder and executive director, Asian Film Archive. For the Short Film and Documentary Competitions, Jobin Ballesteros, filmmaker; at Hanne Robenhagen, cultural sociologist. The 9th CIFF will officially open with a tribute to Robert Malengrau, director of the Belgian International Film Festival. He will receive Cinemanila’s Lifetime Achievement Award for his significant contribution to the development of independent cinema in Belgium and his promotion of Asian films in Europe. He has also been a staunch supporter of Philippine cinema over the years. The CIFF is organized jointly by the Independent Cinema Association of the Philippines (ICAP), the Film Development Council of the Philippines (FDCP), the National Commission for Culture and the Arts (NCAA) and a specially commissioned inter-agency committee with major partners: The Office of the President, the Department of Tourism, CinemaOne and Gateway Cineplex 10. For more information and schedule of screenings, you may refer to the official CIFF website, http://www.cinemanila.org.ph or contact the Cinemanila Secretariat through its email address: cinemanila@gmail.com.